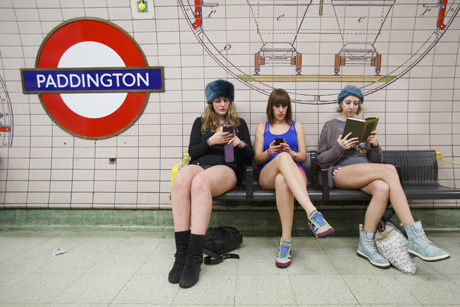 Many London Underground riders went pantsless on Sunday as part of No Pants Subway Ride, which originated in New York City. Since pants mean underwear in the U.K., Brits were careful to clarify that trousers were optional, knickers weren’t. According to the group’s Facebook page, 250-300 people participated this year! Posted on 15, January 2014, in Culture, Humor, News and tagged London Underground, news, No Pants Sunday, pants, Tube. Bookmark the permalink. 3 Comments. haha! i had never heard of this (and didn’t know it was happening in new york, too) until i saw it in person on the train! amazing! 🙂 thanks for posting, trish! Shoko, that must’ve been quite a shock! LOL! My thoughts exactly, Pauline! You’d think they would get participation in July!